February is a great month to craft. Lots of hearts and the colors pink and red. I've always loved Faux Chenille pillows. 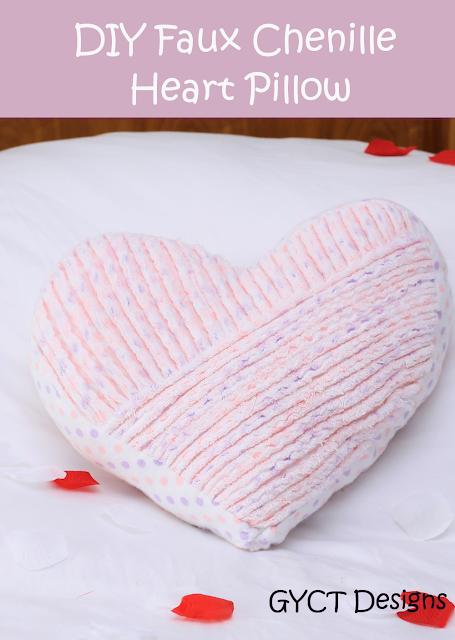 You can see some of the first Chenille pillows I made here on the blog. We called the "wave pillows" or the Faux Chenille Bunny. 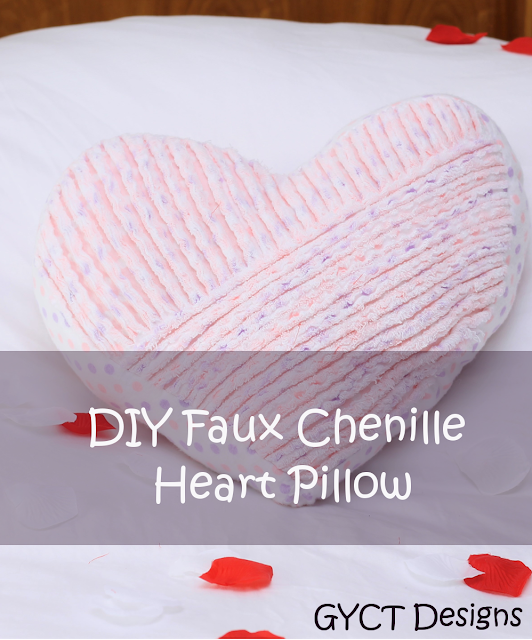 I thought I'd create a tutorial on how to make a faux Chenille heart pillow. Putting together a faux chenille pillow takes a bit of time, but the end result is beautiful and super soft and comfy. You'll love it! Plus, it is a great gift for that someone special. Personally, my children have claimed it as their own, so I'm out of luck. I may have to make several more just so I get a chance to snuggle up to this one. Measure around your heart template. The template I've provided measures 44" around. Cut out a rectangle that is the length around the heart and 4" wide. Cut out 4 layers of the heart template. 2 in one fabric and 2 in the other. Next, stack them on top of one another with all the right sides up. Pin them together. Begin stitching straight lines across the heart that are parallel to each other. You can go diagonal, horizontal, or lengthwise. Whatever you like. Mix it up a bit for a fun look. Take scissors and cut through the top 3 layers of flannel all the way across. Repeat the Steps 2-5 with opposite side of the pillow. Take one of your heart sides and pin the rectangle piece around the raw edges of the heart. Stitch the rectangle to the heart. Pin the opposite side of the pillow to the rectangle. Leave a 2-3" opening so you can add the poly-fil. Stitch the rectangle to the heart. Turn the heart right side out. STOP!! Before you stuff it you must through it in the washing machine and then into the dryer. Why? This is what gives it that frayed chenille look. Don't skip this step. Once it is washed and dryer, you can now stuff it and stitch up the opening by hand or on your machine. 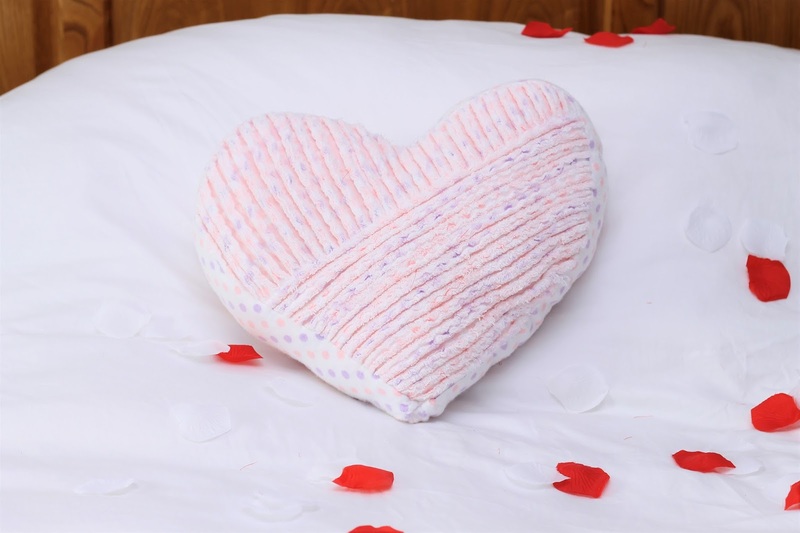 Now you have this soft and comfy pillow that everyone is going to rave about. You'll also never get to cuddle with it yourself, so perhaps you should make 2 or 3 of them. And hide one for yourself. But you see how fast and easy it was to make a Faux Chenille Pillow. It would even be a great project for a beginner sewist. Happy Sewing! !